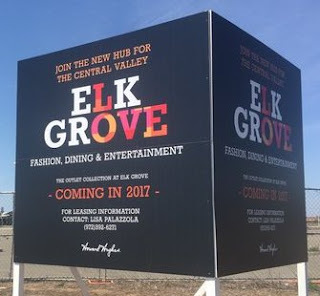 In their letter to shareholders, the Howard Hughes Company (stock symbol HHC) had extensive discussions of their master planned communities at Summerlin outside of Las Vegas and Columbia in Maryland but made scant mention of their unfinished "ghost mall" Outlet Collection at Elk Grove. In their correspondence to shareholders, HHC mentions their Elk Grove holdings three times. The first entry notes their January 2017 $36 million sale of 36-acres at the shopping center to the Boyd Gaming on behalf of the Wilton Rancheria for the development of a resort-casino. Saying the remaining 64-acres at the shopping center has significant "upside" potential, the sale also provided a tax benefit to the company. The report noted HHC "will recognize a tax loss on this sale of $38 million as our tax basis in the asset was substantially higher than our sale price." In the second notation the unfinished shopping center is mentioned with three other properties in their portfolio. The properties, which include downtown Chicago, Dallas, and West Windsor, NJ, are assets that are "held in our Strategic Development segment. Even though they are not part of our core assets, we have significantly advanced predevelopment efforts and have taken major steps to unlock value." The final notation offers some vague guidance on their plans for the Outlet Collection. While the shopping center has been relabeled to a high-end outlet mall, the letter says the Wilton Rancheria and Boyd Gaming "will construct a casino on the site which will be linked to our future outlet/hybrid lifestyle development." We currently trade well below our view of net asset value, however, we ascribe to [Benjamin] Graham’s philosophy that a company’s actual business performance will determine its long-term value over short-term investor sentiment. As a result, we are sharply focused on maximizing our recurring income and the net asset value of our holdings. As a developer of large-scale, mixed-use properties and master-planned communities, we operate with a long-term mindset and our shareholders have benefited from this approach to managing the business. Although the report did not specify when the Outlet Collection would open, last year HHC erected a couple billboards on the site that was followed by much hoopla claiming the center would be open in 2017. To date construction on the shopping center, which came to an abrupt halt nine years ago this July, has not resumed.